Why is Robinson Cano associating with a turd like Jay-Z? Does he know what Jay-Z believes in? 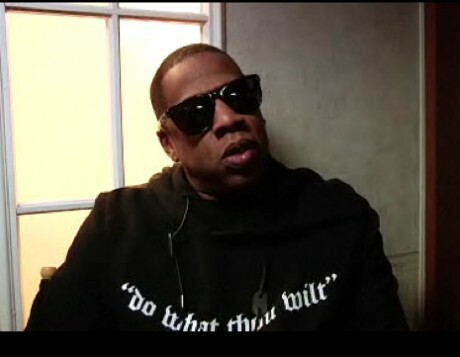 In the photo below, Jay-Z is wearing a sweatshirt with the famous Aleister Crowley saying, “Do What Thou Wilt”. Aleister Crowley is described by wikipedia as an occultist. But the truth be told, he was a satanist. I know he denied being a satanist but his explanation was that he didn’t believe satan existed. Sounds like a satanist to me and this is a guy Jay-Z, Robinson Cano’s agent, follows. Jay-Z is linked to other occult/luciferian groups founded by Crowley. For more information click here. So back to the original question, why would Robinson Cano associate with a turd like Jay-Z? Does he believe in the same things? well, at least he has a belt. 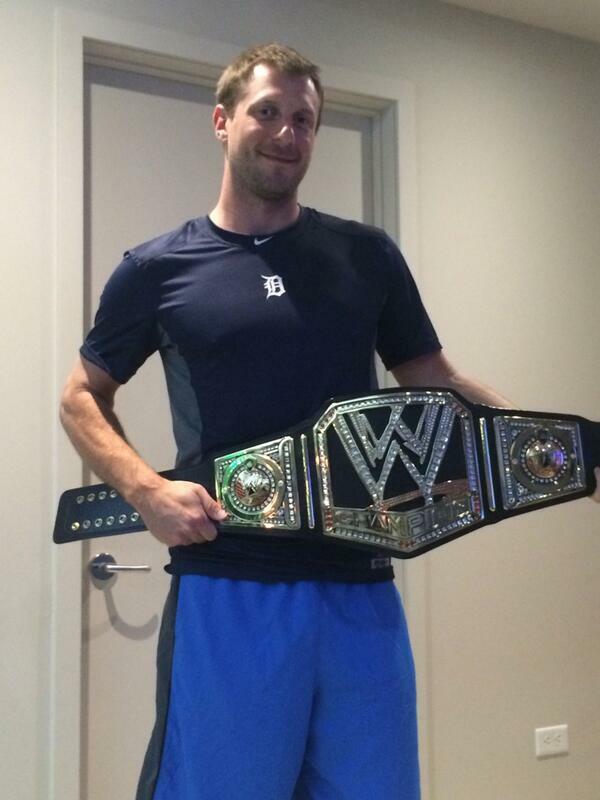 Drew Smyly tweeted this picture of Max donning a WWE Champion’s belt. Apparently, it was a gift to Max from Vince McMahon and the WWE, celebrating his 2013 Cy Young award. Forgive me for not immediately ordering a Davis home jersey. The detnews is reporting, hat tip Nebaraska, that the Tigers have signed, former Athletics and Blue Jays outfielder, Rajai Davis, to a two year contract. According to a report from Sportsnet.ca’s Ben-Nicholson Smith, speedy outfielder Rajai Davis and the Tigers have come to an agreement on a two-year contract. The Tigers have yet to confirm the move, but The News learned late Monday night that the Tigers were zeroing in on adding offense, and were likely to strike soon — and perhaps at the winter meetings. Davis is a right-handed hitter who is in line to be in a left-field platoon with the left-handed-hitting Andy Dirks. I don’t get it. Another platoon player? Great, he has speed but his on-base percentage is .312. It is still impossible to steal first base, isn’t it? This makes the Fister trade look even worse. What are the Tigers going to do with Lombardozzi? A three way platoon with nobody that can hit. All this wheeling and dealing and the Tigers still don’t have anybody to play left field. And, they’re down a pitcher. I feel another Dirksburger episode flaring up. Should this be posted under WTF? It seems that category is getting flooded this off season. I’m not sure how I feel about the Nathan signing. There is no arguing that he’s been great, but he’s 39. I can only hope he has a year or two left in him. People who know me are aware that I like Ted Williams. No, I never saw him play, but he was my Mom’s favorite so I kind of inherited an affinity for Teddy Ballgame along with my passion for baseball. On December 11th, 1951, Joe DiMaggio announced his retirement in New York. The heir to Ruth and Gehrig, DiMaggio had personified a certain graceful nobility, and the Yankee aura of success and invincibility during his relatively short career spanning 1936-1951, with three years out for World War II. In Joe’s 13 seasons of supple-but-sparkling defensive play and prodigious, clutch hitting, the Yankees won an astonishing 10 pennants and nine World Series, a record that served only to put a sheen on his skills and reputation, and define him as a winner. DiMaggio’s acknowledgment of Williams at his farewell press conference was fitting since the two were by far the dominant players of their era — baseball’s Golden Age — and came to be joined at the hip in fan discourse. During their careers and into their retirements, there were endless debates about who the better player was, or who was most valuable to his team, and both men remained rivals for the rest of their lives. For Ted, the rivalry was friendly. For Joe it was fierce. The two were opposites in many respects. DiMaggio was shy, backward and hardly spoke at all. Traveling in a car across country in 1936 to his first spring training as a Yankee with fellow San Franciscans Tony Lazzeri and Frankie Crosetti, Joe never uttered a word, until he was asked if he would like to share the driving, whereupon he said he didn’t drive. Williams, on the other hand, was a chatterbox, with a boisterous, voluble personality and a curious mind. Joe, whose teammates called him the Sphinx, was stolid. Where Ted was explosive and colorful, Joe made it a point to conceal his emotions. What kind of a trade is this? We give you a solid 3rd or 4th starter and you give us 3 guys you don’t want. The Tigers traded Doug Fister to the Washington Nationals for Steve Lombardozzi, Ian Krol, and Robbie Ray. Lombardozzi is a light hitting, platoon, player who can play second base and left field. He’s not playing second base so what is the plan, have him platoon in left with Dirksy? Ian Krol is a left handed pitcher that former Nationals manager, Davey Johnson, stopped using late in the season because he had a 5.74 ERA after June. Robbie Ray is another left handed pitcher but he’s 22 and pitched in A and AA last year. This doesn’t look like a trade that a contending team makes, but what do I know. At least one scout quoted in an article at MLB dot com, agrees with me however. Like I’ve said before, my track record on trades hasn’t been that great but I really hate this deal. The Tigers give up Fister for what Ernie Harwell would call three Humpty Dumpties. FYI: This post had to be posted under WTF. to Texas for Ian Kinsler! According to this post at CBSSports dot com, the Tigers have moved Prince Fielder. The Rangers and Tigers have agreed on a blockbuster deal to send Prince Fielder to Texas for Ian Kinsler, pending physicals and the approval of at least Fielder, CBSSports.com has learned. There was no word yet of any other players being involved, so it may just be a one-for-one swap of stars. Fielder’s salary is much larger, and it is believed money will got Texas in the deal it wasn’t certain how much. I’m not sure why but it just didn’t seem like Prince was a good fit here. He really couldn’t come through when Cabrera struggled, which was rarely, and Prince’s performance in the post season was nothing short of an abomination. He could have been charged with two errors in the 9th inning of game 2 of the ALCS, he got picked off at third in game 6 of the ALCS, and he didn’t drive in a post season run since game 2 of the 2012 ALDS against Oakland. That being said, I like Prince, he just didn’t fit in here. With all of his personal problems perhaps a change of scenery is just what the doctor ordered for Prince and the Tigers. With Kinsler’s acquisition, it looks like Ian will go to second, Miggy will go to first, and Castellanos, though I ‘m not sold on him yet, goes to third. Kinlser can fill the lead off slot in the lineup and let Ausmus move Austin Jackson down to the 7th or 8th spot. Perhaps, even more importantly, the Tigers may have freed up enough money to sign Cy Young winner Max Scherzer. Now for left field. I hope Ausmus didn’t inhert Dirksburger syndrome. He’s not the answer. Hat tip to Nebraska, Vart, Sark and Mickey for giving me the news. Also, a belated congratulations, from Flashin’ Leather to Miggy and Max!